Capitol Peak is one of Colorado's most famous/infamous mountains. It is also one of the most beautiful. 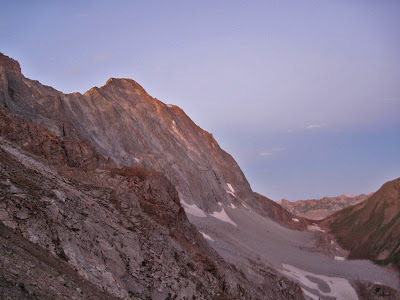 While Capitol's reputation comes largely from the notorious "Knife Edge", a 100-foot long stretch of exposed ridge that must be navigated on the standard route, there are many who debate it's position as "Colorado's hardest 14er". Still, Capitol is a powerful peak that deserves to be approached with respect. How to get there: Capitol lies in the heart of the Elk Range and is accessed from Colorado's beautiful Roaring Fork Valley. From I-70 two and a half hours west of Denver, take the Glenwood Springs exit (116) onto Colorado 82. Follow Highway 82 south for 28 miles. Turn right off the highway at the town of Old Snowmass (not to be confused with the ski area Snowmass Village, which is farther down the road). There is a gas station/convenience store at this exit. Follow this road for 1.5 miles mile to a T-junction and turn right. From here, there isn't much to do. Stay on the main road, ignoring several side streets, for 4 miles until the road turns to dirt. The little road gets a bit rougher from here but should be passable for most passenger cars all the way to the trailhead (9.5 miles after turning off 82). NOTE: There are two trails that leave from the trailhead. The Capitol Creek trail drops steeply south from the parking area down into the Capitol Creek basin. Though this trail is shorter, it requires you to loose/re-gain an additional ~500' on both the approach and the hike out. A more popular variation follows the "Ditch" trail west from the parking lot. While this variation is longer, it does not require the extra elevation gain/loss. Northeast Ridge (18 miles; 5,600' of elevation gain; class 4). This classic route is the epitome of the Colorado 14er experience. It is beautiful, challenging and infamous. It is also loose and dangerous, and several people have lost their lives on this route. 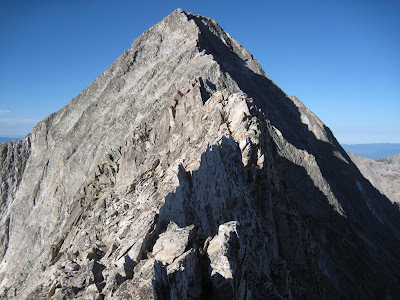 This is the easiest way to climb Capitol, and the route has given the peak a reputation for being Colorado's hardest 14er. The first part of the route is a 6.5 mile approach to Capitol Lake, one of Colorado's most beautiful high-alpine lakes. 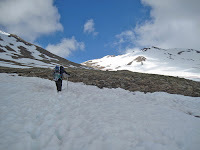 The lengthy and difficulty of this route often prompts mountaineers to camp here to abridge the amount of time the climb will take on summit day. 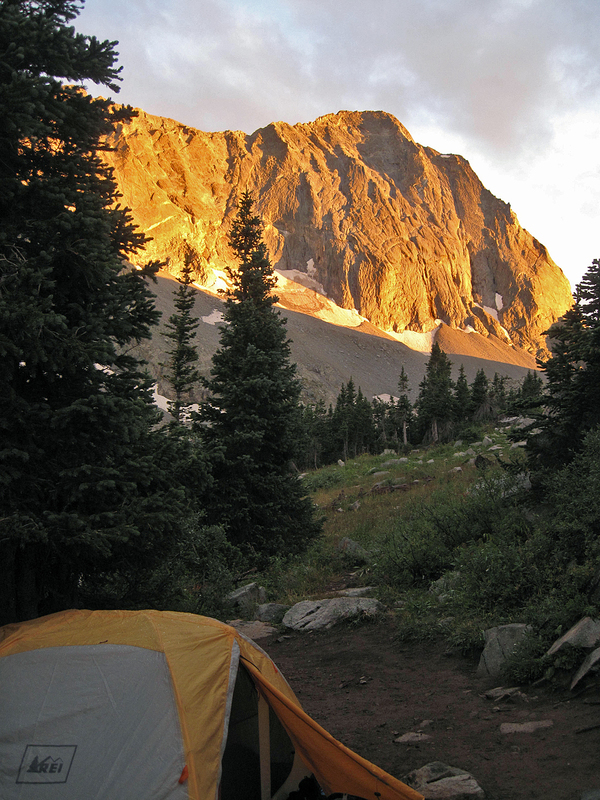 At Capitol Lake, turn east and climb a long, switchbacked trail to the 12,500' saddle between Capitol Peak and Mt. Daly. 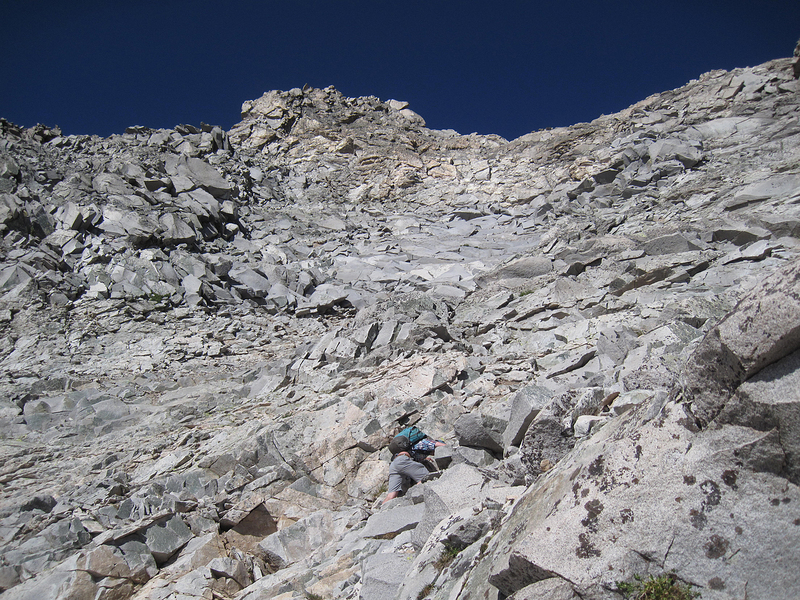 While one variation turns from this saddle and starts along the NE ridge here, most people contour into the Moon Lake Basin to bypass the ridge's loose difficulties. This section is full of boulder hopping class 2+. An occasional class 3 move might be encountered. Follow this basin south and east until you reach and ridge and turn right (west) and head towards a distant point ahead. This point is "K2" and this is where the difficulty begins. There are several ways to circumnavigate "K2". You can either drop into a steep, loose gully to the sub-peak's north and west (loose class 3) or climb to K2's summit and back down the west side. Use caution here, as loose rock is abound and some big cliffs and more difficult terrain is always nearby. Several horrific accidents have occurred in the K2 area. Once around K2 you are deposited onto the northeast ridge proper. Now the route gets more spicy. Navigate an exposed section and arrive at the beginning of the infamous Knife Edge, a class 4 section of the ridge. The exposure here is dramatic, and many people choose to call it quits. In all actuality, however, the Knife is not particularly difficult, and the rock is about as solid as you will encounter on the entire route. Many people choose to straddle and scoot along all or part of the Knife. I found that this technique is not always ideal, though it does feel a bit more secure. Daring souls sometimes tightrope the Knife, keeping it at class 2. Once the Knife is behind you, a long stretch of exposed ridge still awaits. Tread carefully, the rock is loose and one mistake would probably be your last. Once off the ridge, you are committed. On bad weather days I would strongly advise turning back. The rest of the route would not be safe in a thunderstorm. Traverse onto Capitol's NE face, following cairns and climber's trails as they zig-zag up the mountain's steep, loose slopes. There are several possibilities to reach the summit here. You can follow the ridge direct, a more stout variation (5.0-5.2 R) or switchback up the NE face itself (class 4). Another variation traverses south onto Capitol's south face and up to the summit from there (also class 4). 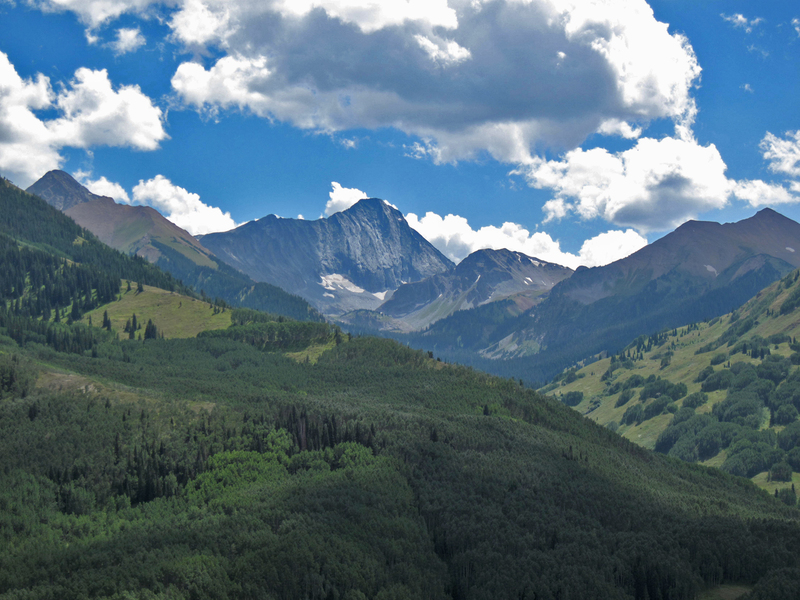 Enjoy the dramatic views of Snowmass Mountain to the southeast, and yodel from the summit; Capitol is yours. This technical route is one of the only viable class 5 14er routes in the Elks.It is an amazing and dramatic line. There are two variations of the ridge, one which goes at 5.7 with some steep, loose rock/ice. A more solid variation that has become more popular in recent years is a bit more challenging (5.9) but generally considered safer. Follow the standard route to Capitol lake. From here continue south along the west shore of Capitol Lake to a saddle on the northwest side of the peak. The route looms from here. There are several pitches of technical rock here. 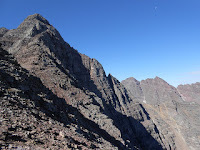 For a more detailed description of the route, refer to Gerry Roach's Colorado's Fourteeners.